If you’re tired of canvas on an express cruiser, Four Winns’ V435 may be just the ticket. The standard hard top contains two skylights plus a power retractable, almost full-width smoked glass sunroof section which itself allows center walk-thru to the foredeck. Aft camper canvas is all that’s required to enclose the entire area, and it’s standard equipment. As you might expect from Four Winns, the V435 is loaded with standard equipment far too extensive to fully cover in a short article. Starting at the stern, notable standard features include a massive extended swim deck with built-in centre storage tub for fenders. As an option, this swim deck can become a hydraulic lift for a watertoy or dinghy. Cable TV, telephone, dockside water, and shorepower with retractable cable master hook-ups are provided along with a stern-mounted electric grill and storage locker. The cockpit is conversation and entertaining friendly with dual individual helm seats, a facing double lounge, plus huge rear U-shaped lounge. Standards include a refreshment center with icemaker, refrigerator, sink, and table. The driver’s seat is power adjustable and the helm includes a full complement of instrumentation plus Volvo Penta’s dual Electronic Vessel Control units with joystick. The cabin interior offers a maximum of over seven feet of headroom with a standard and two optional choices of layout. Amenities include air conditioning/heating, central vac, true hardwood flooring, microwave/convection oven, electric stove, refrigerator/freezer, private forward stateroom with island berth with inner sprung mattress and power adjustable headrest. The salon dinette “sofa” converts to a double berth as does the mid-cabin L-shaped sofa. A second head is optionally available when this mid-cabin is “privatized.” The forward head features a separate shower area. A washer and dryer is optionally available. Three choices of Volvo Penta IPS power with Joystick control are available, two diesel and one gas, each with the appropriate generator standard. A dual-control electric anchor windlass with rope, chain, and anchor are standard as are dual windshield wipers, a fancy Sony stereo system, two flatscreen TV’s, and trim tabs. Other notable options include foredeck sunpads, underwater lighting, cockpit air conditioning, and a full selection of navigation electronics. 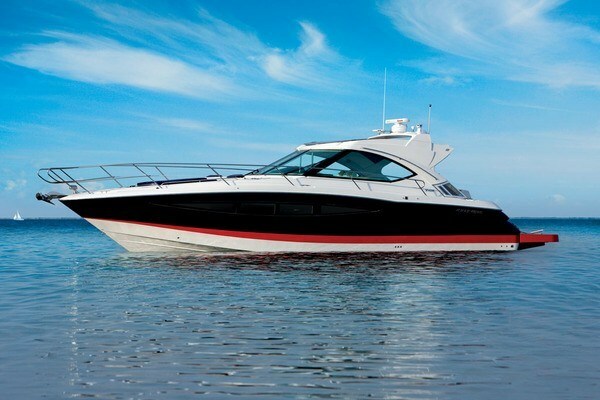 The V435 is a roomy, comfortable, airy, accommodating and well appointed express cruiser.